History: The origins of Four Horsemen Toy Design Studios can be traced back to the four partner’s days of working together in the trenches of McFarlane Toys. Eric Treadaway, Jim Preziosi, H. Eric ‘Cornboy’ Mayse, and Chris Dahlberg discovered early on that their various abilities worked well together, and they tried to make sure that each new project that came their way became a collaborative effort between them. After working together at McFarlane Toys for a few years, they realized that the toys that they were having to design and create were moving in a somewhat different direction than they had anticipated. It was during this time that one of them jokingly said that they’d ‘eventually ride off like four horsemen into May the sunset’ to start their own toy design company. No one has done more for the cause than the Four Horsemen. In the 1990s, the amazing work of the sculptors at McFarlane Toys won them many fans–even if those fans didn’t know who they were. About seven years ago, four of those sculptors–Eric “Cornboy” Mayse, Chris Dahlberg, Jim Peliozi and Eric Treadaway–decided to leave McFarlane and strike out on their own, creating the Four Horsemen design studio and quickly striking up a deal with industry giant Mattel to bring back one of the company’s most famous toy lines, He-Man and the Masters of the Universe (MOTU). Featuring distinctive high-quality sculpting and unique character designs, the MOTU revamp made celebrities out of the Horsemen, thanks largely to Mattel’s strong public support for the team. 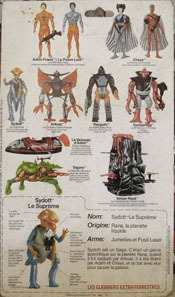 Since then, the Horsemen’s talents have been on display in figures for Toy Biz (now Marvel Toys), NECA, and of course, their own FANtastic Exclusive–an innovative Web project in which the Horsemen ask action figure fans to help design of a brand-new, original action figure to be sold at the following year’s conventions. Fans get to vote on every step of the process, from character selection to scale, to articulation and accessories. It’s an ambitious project, and its continued success (it’s now in its third year) may represent the next small step–or giant leap–for the action figure industry. I’m very happy to call the Horsemen friends of mine. Not best friends, but not mere acquaintances, either. I mean, if I ran into one of them on the street–once I’d explained who I was–we could stop and have a conversation. And not an awkward one, but a genuine exchange of ideas. Or maybe we’d just grab a beer. Anyway, the Horsemen have very kindly granted PoA an interview for our second-ever blog post. Read on to get an insight into how the Horsemen design toys, what their favorite Christmas presents were, and even who Santa’s favorite superhero is. Poe Ghostal: Do you do any sort of research before you begin to sculpt a figure? 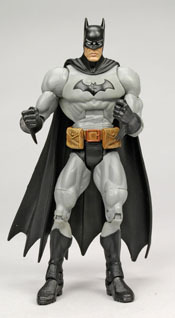 For instance, what inspired the detailing on the DCSH Batman’s gloves and boots? ERIC TREADAWAY: We absolutely do. When we started on that version of Batman, the guys over at DC were really encouraging us to push things a little more than we normally had. One of the things that was mentioned was to take some cues from the latest Batman movie in the way that his costume had a very “super heroic” feel while still being tied very much to the real world. From there we decided to take a slightly more utility/military approach with certain aspects of the costume. This carried over into portions of the Batgirl costumes as well. JIM PREZIOSI: For those in particular, we searched out reference for both the boots and the gloves, and then upgraded them somewhat to make them seem a little more futuristic. We have lots of books and magazines around the studio that we keep on hand for reference, but a lot of reference that we use now comes from the internet. We really wonder how we got by before the World Wide Web. PG: When you sculpt a figure that is using some reused or retooled parts, do you just sculpt the torso, or arms, or whatever the new parts are, or do you also use the reused parts as a base? CHRIS DAHLBERG: During the sculpting process we combine castings of the parts that will be retooled with any newly sculpted parts there may be. When we send the tooling patterns over to Mattel, we only send them the newly sculpted parts. They’ll already have the steel tooling made up for the pre-existing parts. PG: Regarding DC Superheroes: Some of the figures in this line (in the early Batman/DCSH days, at least) seem inspired, design-wise, by their DC animated counterparts (e.g., the first Supergirl release, Clayface, Mr. Freeze). Other characters are clearly based on 【水野朝陽】「誰にも言っちゃダメよ…」甥の性処理懇願に…授乳手コキ＆優しい騎乗位でオマンコに出させてくれました their 1980s Super Powers look (Lex Luthor, Brainiac, Crime Stopper Batman). Do you usually try to select the most “toyetic” version of a character, the most classically iconic, or both? JP: A little of both actually. We like to find what we consider to be the most iconic version of the character, and then see if there’s a way to blend in the best aspects of other versions of that character from throughout the wholesale NBA jerseys character’s history. Whether those aspects are from movies, comics, cartoons, previously made toys, underroos, whatever helps us to create the coolest figure we can make. Then we try to add a little of our own flair into the character. Luckily, both Mattel and DC have really encouraged us to do just that, rather than seeing it as a negative thing. PG: We know you guys wholesale nba jerseys were fans of the original Masters of the Universe line. Were you also big fans of Super Powers and Secret Wars? How does it feel to be sculpting classic heroes like Batman and Superman? Eric “Cornboy” Mayse (CB): I really liked both Super Powers and Secret Wars. I still have the Secret Wars Iron Man floating around somewhere, and I have quite a few of the (very well used) Super Powers to figures as well. Still don’t have Shazam (Captain Marvel) though…. Working on Superman, Batman and all of the other DC SuperHeroes is like a dream come true for us. Being big comic and toy geeks as kids (and even now), there’s no cooler job we could have. ET: Exactly. When we learned we were going to be working on Masters of the Universe for Mattel, our thoughts were, “How could it get any better than this? There’s no way.” Now we’re working on a whole universe of other iconic characters in the DC Universe, and we’ve been proven wrong. It got better. Besides Masters of the Universe, Super Powers was one of my favorite toy lines as a kid, and to get the chance to go back and re-do many of the characters that were done in that line is an honor. PG: Let’s talk about Wayne Barlowe’s Power Lords series. Some of you have mentioned your love of this line in the past. How much did it inspire some of the lines in the Fantastic Exclusive concept? ET: Power Lords is one of my favorite lines of all time! I feel like it was underrated as well as way ahead of its time. The designs were so strange and so well designed, I think they were just over people’s head at that time. If there were adult collectors then like there are now, it might have been a different story. As far as influence, I would say that Power Lords has some impact on every line that I design. Not so much the specific look, but the idea of making a line with such a diverse group of differently shaped and sized characters with designs that range from the “normal” looking to the bizarre. The line more specifically influenced the alien line that was in the previous two years of FANtastic Exclusive. I always loved the fact that the Power Lords, along with many of Barlowe’s designs, actually looked so alien rather than like humans in costumes. 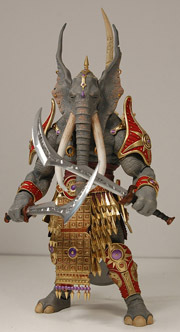 PG: The production on the Ramathorr exclusive had a few problems. What have you learned from the experience, in regard to future Fantastic Exclusives? CB: Wow. We’re still dealing with issues that we ran into with the production of Ramathorr. When we first started producing our own action figures, beginning with Commander Argus and later Xetheus: Champion of Mynothecea, the production process went really smoothly. Of course there were a few hiccups here and there, but for the most part we were wondering what the big deal was. We’d heard so many horror stories, but hadn’t experienced any of that ourselves. People told us that we had been pretty lucky. Well, our luck almost ran out during the production of Ramathorr. From the beginning there were pricing issues, then when we received the product it didn’t meet our expectations so we talked the factory into going back into production to repair the problems. We were then told there would be a delay in our production because larger companies Points were pressuring them to get their stuff done first. The most recent problem was that the factory we were using decided they were shutting all production down permanently before our production was finished and we might lose all of the steel molds that we’d already paid thousands of dollars for. It became a nightmare. JP: Luckily, a friend of ours was over there working at the time. Between his efforts and a lot of help from the guys over at NECA we were able to retrieve our molds from the closed factory and move them to another factory to begin production anew. So, the good news is we got our molds into a new factory and are starting production again. The bad news is that we’ve lost the money we paid to the closed factory so far, and we’ll probably have to pay most of the money a second time to the new factory in order to do the new production run. The worst part is that we just have to sit back and let it happen, because there’s not really all that much we can do about it. PG: Do any of you collect the holiday-themed toy lines, such as Rudolph the Red-Nosed Reindeer or Frosty the Snowman? ET: Somewhat. The Rudolph figures that were released a few years ago were really nice, and the “Year Without a Santa Claus” figures that NECA did a while back were fantastic. The Heat Miser and Snow Miser figures are awesome. 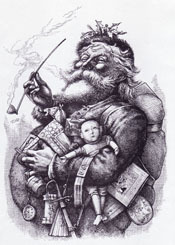 PG: Here’s one for the kiddies out there: how closely do you work with Santa around the holidays? What’s he like? JP: Santa’s pretty cool with us. When we originally started the company he didn’t come around much because we’d all somehow made it on his “naughty” list. We think Todd McFarlane might’ve had something to do with that. But then after he found out that we’d sculpted two different Batgirls for Mattels’ DC SuperHeroes line he immediately switched us over to the “nice” list. In case you didn’t know, Santa’s a HUGE Batgirl fan. He drops in every week for Taco Bell Friday now. Want us to put in a good word for you? PG: This one is for all four of you: what’s the best toy you ever received on the holidays? CB: Mego Planet of the Apes figures and treehouse. Out of all of the PotA figures, the Ape Soldier was the one I wanted most. Even if I didn’t get all of the others that I wanted, if I only got the Ape Soldier I would be happy. After opening all of the presents I got, there was no Ape Soldier. I was bummed out. Then my Dad asked me how I liked the motorcycle model kit Santa had brought me. I had no idea why Santa would have brought me the exact same model kit that my older brother had bought just a couple of weeks before. Dad, being sneaky and pretty damned mean had hidden the Ape Soldier in that model kit box. I was pretty happy after I realized what he’d done. JP: I had a pretty unusual toy. 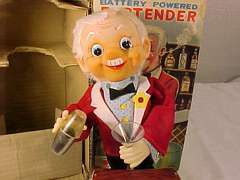 It was a metal bartender whose nose would light up and smoke would roll out of his ears as he was making you a drink. It was a pretty unusual toy for a kid, but at the time I didn’t look at it the way someone would see it today. I just thought it was a really cool toy with an awesome action feature. I recently found a couple online and started collecting them again. There are a lot more variations of that toy than I thought there were. 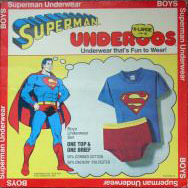 CD: Underwear. You play with what you want to, I’ll play with what I want to. ET: That would be a toss up between the Shogun Warriors Gaiking and the 18″ Alien action figure. The 18″ Alien figure might have a slight advantage because my Dad swore up and down that Santa would never bring me such a violent toy. I was pretty overjoyed when I opened it up on Christmas morning. Apparently Santa hadn’t seen the movie yet. 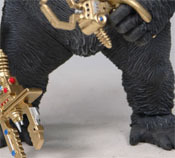 PG: To elaborate on something Cornboy mentioned on TheFwoosh.com, which one of you is the best at sculpting gorilla crotches? CB: Oh that’s an easy one! The Fifth Horseman: Shane Dittsworth! He normally handles all of the molding and casting duties around here for us, but when it comes to sculpting gorilla crotches…stand back! We just hand the crotch in question off to him, and gather around in stunned awe at his crotch detailing prowess! It’s simply mesmerizing to see in action. So there you have it. The Four Horsemen: No one sculpts a better gorilla crotch. I’d like to thank the Horsemen again for taking time out of their extremely busy schedule to answer a few questions. From what they’ve told me, 2008 is going to be one heck of a busy year for them, with all sorts of secret projects–and of course, their annual FANtastic Exclusive!